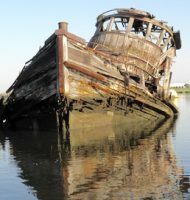 “Graving” means scratching: scratching rust, barnacles, and mussels off a hull so that it can be repaired and resurfaced. Mary Whalen is a step closer to its second life right now. “The mussels flew,” Carolina says, “and got shoveled out of the dock.” The two rusty pipes to port near the superstructure are spuds, stilts that will pin it in place to the river bed. 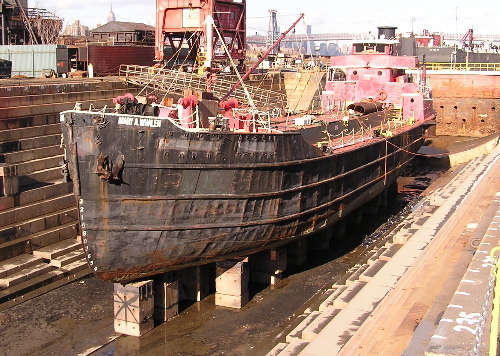 With the Empire State Building and the Williamsburg Bridge as backdrop, Mary Whalen awaits next step toward its second life: sandblasting and bottom paint. Notice beyond the yellow railing at Mary Whalen’s stern, there’s a fuel barge floating in that portion of the East River. 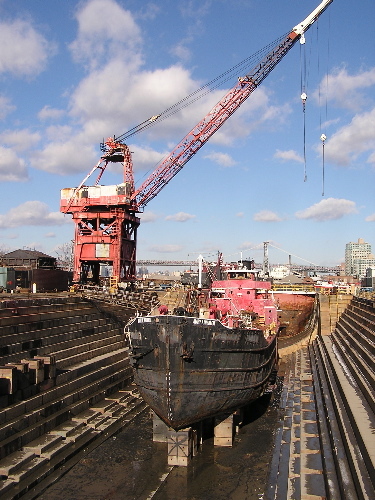 By the way, if you’re not familiar with the harbor, this graving dock is on the east side of the East River, between the Manhattan and Williamsburg Bridges. Also, think about size: there’s room to spare around Mary Whalen, its 172-foot length appears shrunk by the size of the dock and gantry crane. Watch for updates at this link. Also check there for the fascinating timeline of the Navy Yard. Can’t wait to see this bottom painted. With support, there’ll be a new prop and an engine functioning to turn it so that it can be a roving ambassador/educator. 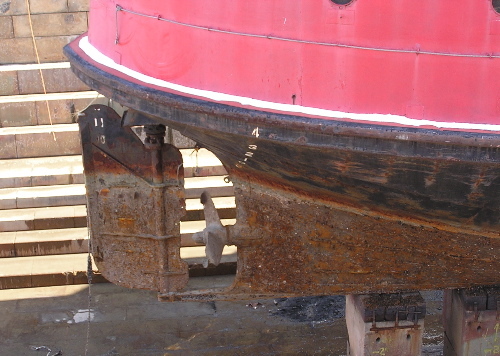 The keel and hull rests on blocks of hardwood to protect the stone. Check this link for a graving dock built in Liverpool in 1765.